Multi-protocol support and hardware agnostic. Connect any device and any 3rd-party application. All the benefits of open source solutions: transparency, control, community testing, support and bug fixes. No client access licenses issues. No vendor lock. Apache 2.0 license. Modern architecture, complete set of easy-to maintain services with clear division of responsibility. On –Premise, any Cloud which supports Docker,on the Edge, even on RPi Class Device. Native deployment, Docker containers, Kubernetes deployment. Modern, highly concurrent, readable, easier to maintain,fast/efficient, highly portable (runs on Windows, Linux, Mac and both Intel and ARM CPUs). NGINX reverse proxy for security, load-balancing and termination of TLS and DTLS connections. Security at every layer. Good isolation, fast startup, easy to distribute, small footprint due to Go and multi-stage builds (~5MB per microservice), production deployment using Kubernetes. Thanks to Golang language, it has tested performance, deployment speed, fast and robust execution, small footprint. 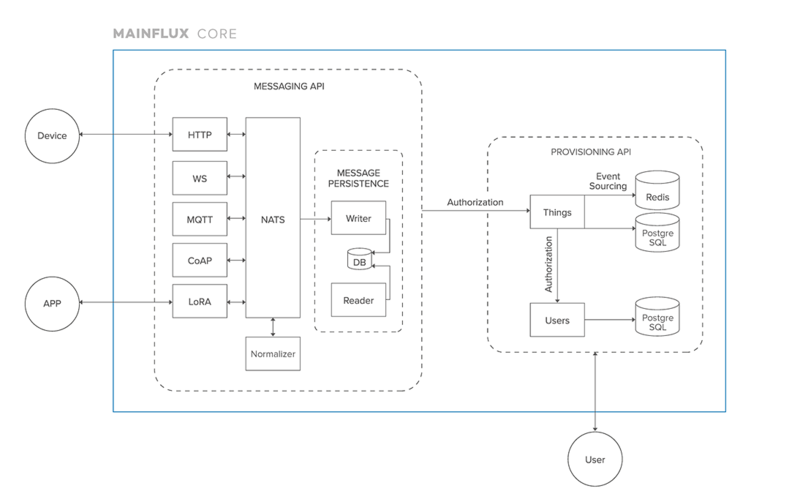 MQTT, WebSocket, CoAP) based on NATS ultra-performant broker. No need to configure and modify the core of the platform for additional functionalities. LoRa adapter for bridging between Mainflux IoT platform and LoRa Server service. of all components and microservices necessary for IoT solutions, projects or products. with existing enterprise applications and other IoT solutions. Bidirectional communication (interaction) with very large number of devices and gateways, using different open protocols and data formats. Normalization of the messages for easy integration with the rest of the infrastructure. Security from the edge using encrypted channels to secure data. Support for several authentication factors (Authentication - Multi-level-authentication) and specific data-access-rules. Monitoring network data usage and billing and generating notifications and alerts. NATS -message broker , an open-source scalable messaging system used for message exchange within the Mainflux platform itself. Multi-protocol support and hardware agnostic. Connectivity for any device and any application. Ensures the connected objects, devices and gateways are working properly and its software and applications are updated and running. Aggregation and collecting data from devices and processing and storage to database - a scalable data store that supports the volume and variety of IoT data. Support for databases that store and process data in multiple data models. Scalable for big data and able to store both structured (SQL) and unstructured data (NoSQL). Integrated development environment for custom IoT applications and industry grade IoT solutions, rapid prototyping and development of intelligent products. Seamless provisioning of any device or intelligent /smart product access management. Setup is quick and easy, enabling developers to save implementation time. Interactive user interface for device management sending commands, changing configuration and metadata, etc. System manangement: Create Things (devices and apps) and channels, manage connections and control activity. Data Visualisation: Graphs and maps to visualise messages received and devices locations. Rules. engine: Configuration of rules to inform user depending on the received data. AI: apply AI on data to extract informations about your devices. databases, analytics programs, back-end systems and other cloud services. Built-in application programming interfaces (API), software development kits (SDK ), and gateways. IoT Protocols: HTTP Server, WebSocket Server MQTT Broker, CoAP Server. Extensible: Adding new functionality for vertical solutions and applications does not require reconfiguration or modification of the core platform. Permitting the continued flow of data and operations while preferred functions are extended. Mainflux is the highly-secured system. It has a dedicated authentication and authorization service that protect the system from unauthorised access and unauthorised devices and applications. All messages and all network traffic coming from or to Mainflux are encrypted by latest security standards (TLS v1.3). Dedicated Mainflux Security server written in Golang. NGINX reverse proxy for security, load-balancing and termination of TLS and DTLS connections. Authentication (token based) and Authorization with fine-grained access control TLS and DTLS (HTTPS, WSS, MQTT with TLS, CoAP with DTLS). API keys based on JWT.